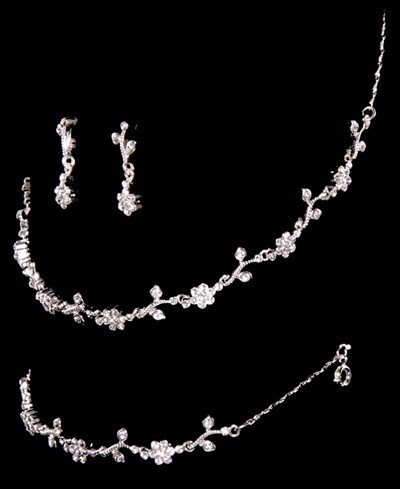 Set includes matching earrings, bracelet, and necklace. A scalloped design is achieved by the leaf to rosette pattern. Each leaf is accented with a rhinestone. The stem of the leaves are silver-toned and give way to rosettes set with rhinestones. FWO Extras: Necklace is 16 inches with 2 inch extender. Bracelet is 7 inches. Earring Length is 1 inch.